Oh my stars, I'm in love with all of the colorful goodness ! Boy, you really do like that block! I like your pieced sections, very creative. Jackson yawning is just too stinkin' cute, he is ready for all kinds of naps in these pics. Pinwheels are so much fun. In my head, I have a big scrappy pinwheel quilt planned! This is great motivation to get to it! You have such wondeful quilts! Love this trunk show! Pinwheels make for such fun quilts - and they move the eye in great joy. NICE!!! I like the idea of one theme. Those are great, but I just LOVE the one with the "made" fabric. oh Jackson! so handsome. The pinwheels are so happy! Fun to see so many. Looks like Jackson loves pinwheel too. Love the Orange and lime one! Quite a variety of the same pattern. Love the one made with made fabric. Guess Jackson does, too. Thanks for sharing. Love your collection of pinwheel quilts! Certainly one pattern that is so versatile and happy! Beautiful pinwheel quilts! That block is a favorite of mine also Val. Jackson is sure a cutie! Wow, I *LOVE* your pinwheel quilts! So much yummy color and movement! I've never made one, can you believe it? Just the other day, I was thinking I needed a fast, fun pattern just right for fat quarters. I think you have provided the answer for me. What size do you cut the initial squares for your pinwheels? A wonderful group of quilts--fun! I love the pin wheel block too. Your quilts are just lovely. I love the rainbow one with the made fabrics and the Christmas one! Great quilts. I'm a fan of pinwheels too. cute post and fun quilts! Val~they are beautiful, I really love your Christmas quilt. Pinwheels are fun and nothing wrong with that. Now you will have to try Missouri Star tutorial on the Pinwheel in a churn dash! That's what I am currently working on. It always amazes me how changing up the fabric can create a totally different looking quilt. Your pinwheels are beautiful! What fun! 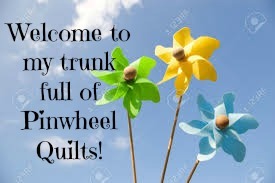 I love pinwheel quilts too and yours are beautiful! This is a sweet collection Val. Especially love the scrappy quilt and the Christmas quilt. Wow! That's a lot of pinwheels! They are all so happy! I think you were brave to do pinwheels as a beginning quilter. They would have scared me--all those seams coming together in the middle! But you obviously mastered them right away. Such a great assortment of pinwheels! So glad they are well loved - that is the best part of making a quilt. Love the blue and yellow one..... I must resist making one (something about 30+ in process things) but it will be difficult with your pretty ones in this post. I loved seeing all of your pinwheels together. It is a great fun pattern. I nearly made it a second time, but then turned it into a disappearing pinwheel instead. I love your use of bright colors! I never knew there was so much that could be done with a pinwheel. Love them all. Oh how I love all your pinwheel quilts. They brighten up my day, totally. My favorite must be thos scrappy ones. Great job. The pattern may be the same, but they all have such a different vibe. Very fun. I'm still in love with the rainbow pinwheels.